I don't know about you, but when I spend any length of time on pinterest my head feels like it might explode with felt, glitter, peppermint essence, gingerbread and a variety of handmade snowflakes!!! Ahhh! Its amazing that there are so many wonderful crafts and kid's activities out there for us all to be inspired by, but its easy to become overwhelmed by the abundance of ideas... I want to do everything!! But then, Id be crafting, making, painting all day every day until next christmas (which isnt necessarily a bad thing), but I, like many of you Im sure, have a house to clean, dinners to cook, children to cuddle and read stories to... I do want to do lovely christmas crafts, bake festive yummies and create seasonal family traditions, and I definitely do NOT want to feel guilty about the things I haven't managed to do. 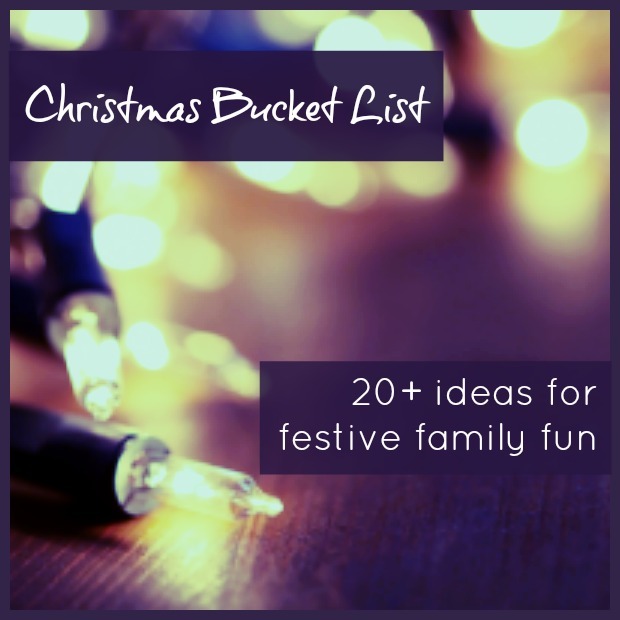 So to that end I am here, creating this bucket list of things I want us to do this festive period. 1. Make gingerbread. I don't mind if its gingerbread men, or houses, or something else, but I do want to bake some gingerbread and decorate with icing and silver balls. Taming the Goblin have a lovely recipe. 2. Salt dough ornaments. We did them last year, and we loved it; they're so simple to make, include different stages so can be spread out over a couple of days (good for small children who have teeny attention spans) and its nice to have a lasting product that we can use, or give as gifts. 3. White Clay Ornaments. The Imagination Tree just recently posted about this - and they look fabulous!! Similar to the salt dough (above), but snow white and more playdough like. 4. Make our own wrapping paper. Ive seen lots of ideas for this, but essentially its printing or sticking christmas shapes onto plain paper. Taming the Goblin just tried this here, and RedTedArt have some lovely ideas, including cookie cutter printing. (I still have reams of brown paper from the various amazon boxes that we have got over the last year; if you take out all that screwed up paper, unscrew it and fold it up its a great free craft material). 5. Make our own christmas cards. Just simple ones that Jake can join in with, maybe with handprints on to so Poppy can get involved too. 8. Some seasonal sensory trays; we did a Winter Wonderland sensory tray last year, and Id like to get creative with some more christmassy ones, and some yule and solstice ones too... The Imagination Tree has some lovely ones, including this Christmas Sensory Tub. 10. Yule log - I celebrate winter solstice, so I always make a yule log centrepiece; sometimes from cake, sometimes from a real log, with holly, pine cones, candles and icing sugar. 11. Toilet Roll Christmas Characters - Happy Hooligans have this lovely toilet toll nativity set, and I have seen some jolly santas popping up on pinterest and these delightful reindeer from Kiertoidea. 15. 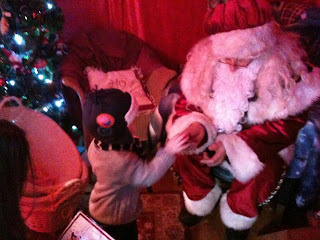 Go to see Santa - there are a few places here in Jersey that we can go to visit Santa, the local garden centre has a lovely grotto and we really enjoyed it last year, so we'll be going back again this year. 16. Go to or have a Christmas Party - Christmas is about celebration (whatever it is that you choose to celebrate) so a christmas party is a must! We are going to a Toddler Sense christmas party and we will be with lots of family on christmas day for party games and food! 17. Celebrate Winter Solstice - Winter solstice or yule is all about celebrating the winter, gathering food, coming together as a family in the home, creating light for the home during the dark months and the beauty that winter creates. This is something I have celebrated for a long time and am looking forward to introducing my children to it. 19. Bake Mince Pies - Yum! We'll be doing lots with my Mum's pastry recipe. 20. Find and read Christmas books - Even though we have an enormous book collection we hardly have any christmas books, so Im off to the charity shop to find some and then have a lovely christmas storytime with hot chocolate and cuddles. 21. Go to church... I am not religious, none of my family are really, however, I do think its important for my children to be aware of the different reasons and traditions surrounding Christmas, so I would like to go to a Cristingle or nativity service for them to experience these things. 23. Make reindeer food to leave out on christmas eve. This came from Connecting Family and Seoul's Countdown to Christmas list, which has some lovely ideas on it. 24. Make a christmas eve box - like this one from The Imagination Tree (they have sooo many good ideas!). We are travelling on christmas eve, and will be staying away from home for the week following, so I think I will make a christmas busy bag for the plane/car and a christmas eve box to help calm down and settle in on Christmas eve evening. perfect snowglobe jar found! Start eating peanut butter :-) They are beautifully clear jars, no pattern AND are plastic so doesnt matter if little ones drop them.... Great list by the way! This is a great list. I think I'll have to add a few to our to do list - especially the Christmas Eve box. Thanks for sharing at the Sunday Showcase!